Holy cow! 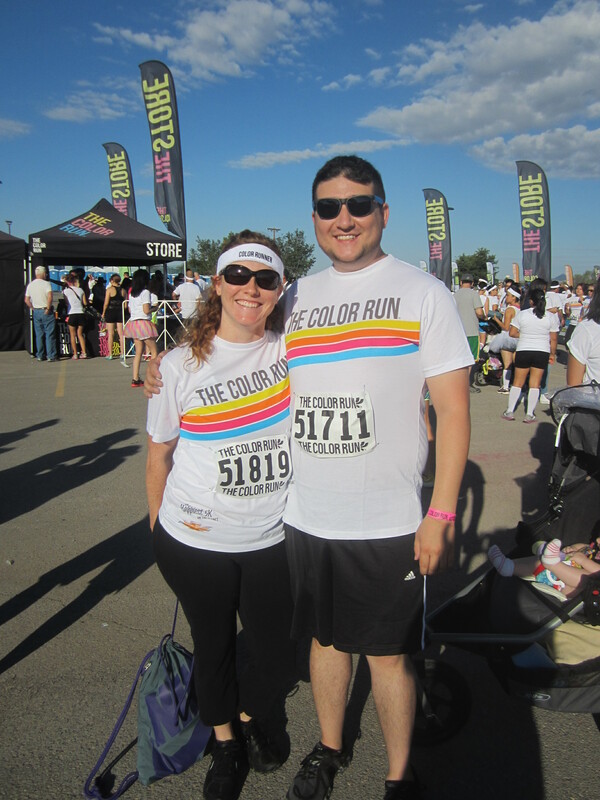 It has been three months since we did this race, but I am going to try to recap what we did. So yes, one of our long-term goals this year was the return of Lady Cluck and the Boys. 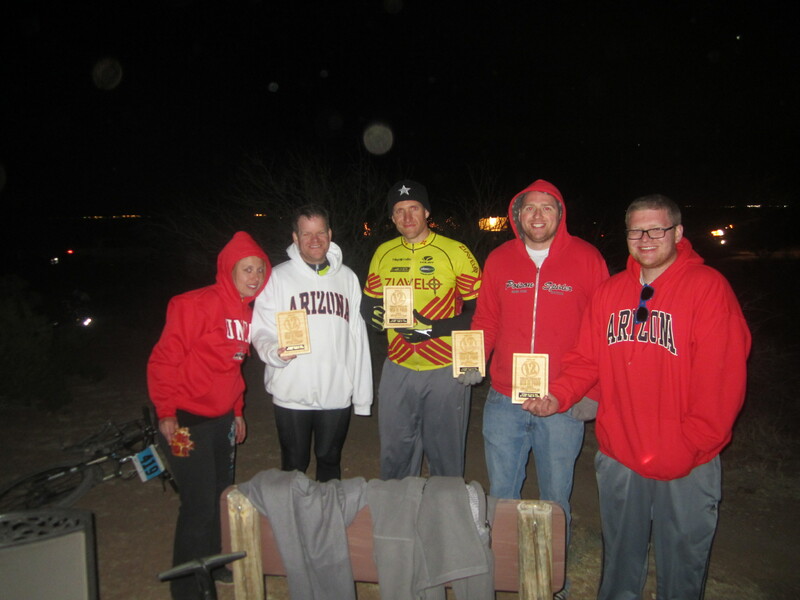 Mike, Brent, Jared (and Brad), and I signed up for 4 man co-ed race for the 12 Hours In the El Paso race on February 1, 2014.. It started out with me on the first lap. I have never started a twelve-hour race. In case you don’t know, you have to run to your bike in your bike shoes to start the race. (That was very interesting!!) The other factor I didn’t think about was how we were ALL starting at the same time! It was really hard for me to keep up with the fast people and then I would get stuck behind slow people. I ended up averaging about a 1 hour and 15 minute lap! Every single person on our team ended up riding two laps and it worked out perfectly. 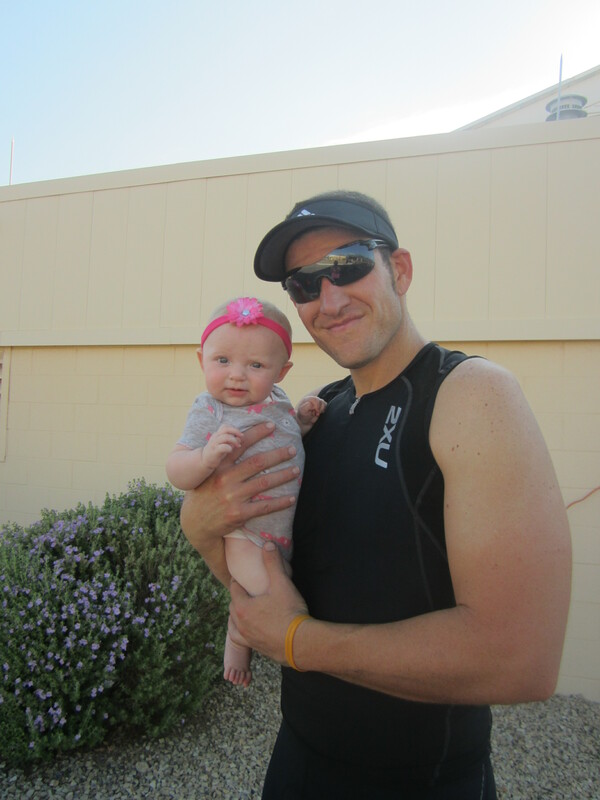 The timing for me was impeccable because the baby took her nap when i went out on my second lap. The boys kind of got jipped because each of them had to do a night lap. I was the last person to go at sunset….so lucky! I am a terrible night rider! 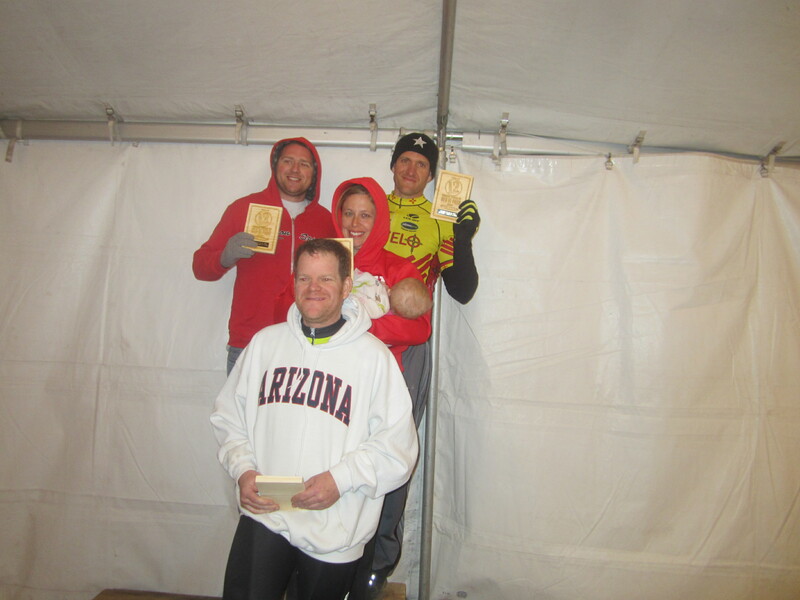 If you look closely, yes I am holding a baby on the podium! Haha. She lasted the whole day! This is Brent going out on his night lap. The first part of the race is pretty fun because you are doing a section called Lazy Cow that is super windy. 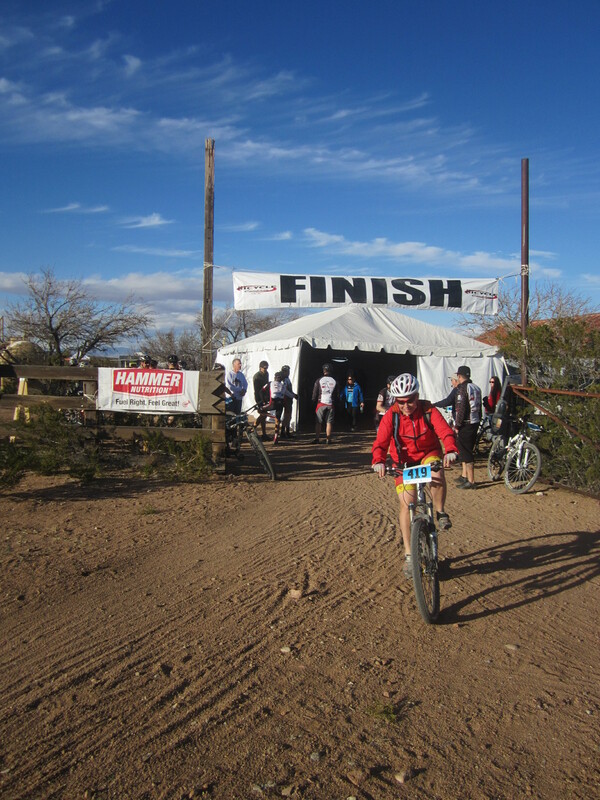 Then you hit an uphill climb for a huge portion of the race and then it is all downhill from there…until you head back to camp. 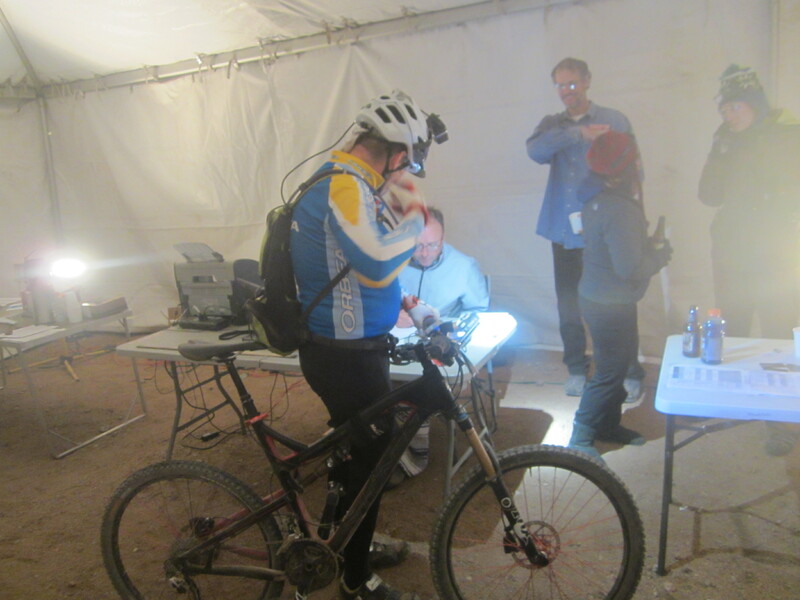 This year they added a little more miles to the race and had you come into camp and take off on some more treacherous trail. I hated it! It was pretty hard and mentally hard on me. We had some friends and family to come out and support us! That was fun! This last part of the trail is a jeep road that is downhill. It feels awesome to fly down it and hit the finish line! We did it! We got first place! Lady Cluck and the Boys did not disappoint! Since the weather has been completely awesome here (I apologize to the people back East), Mike and I have been out riding as much as possible. 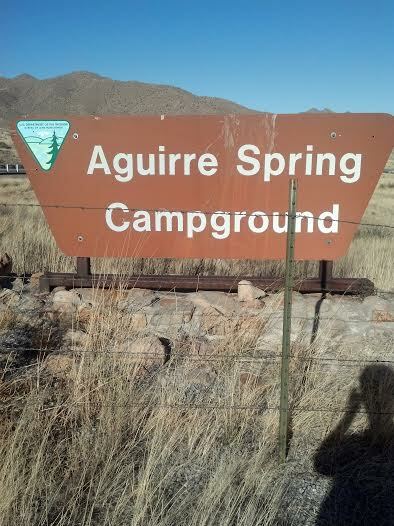 We took off to Aguirre Springs on Saturday for some major hill climbing. 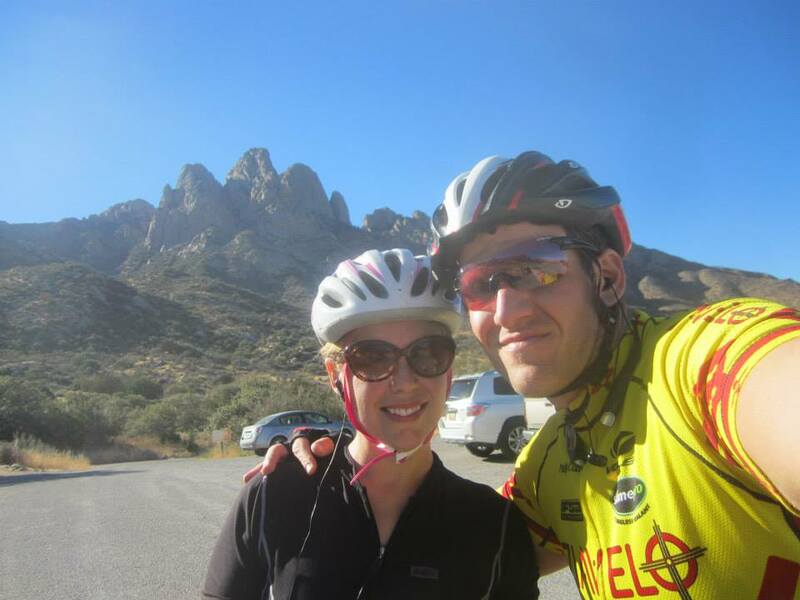 We like to park on the opposite side of the Organ Mountains and then bike up the pass over into the Aguirre Spring campground area. 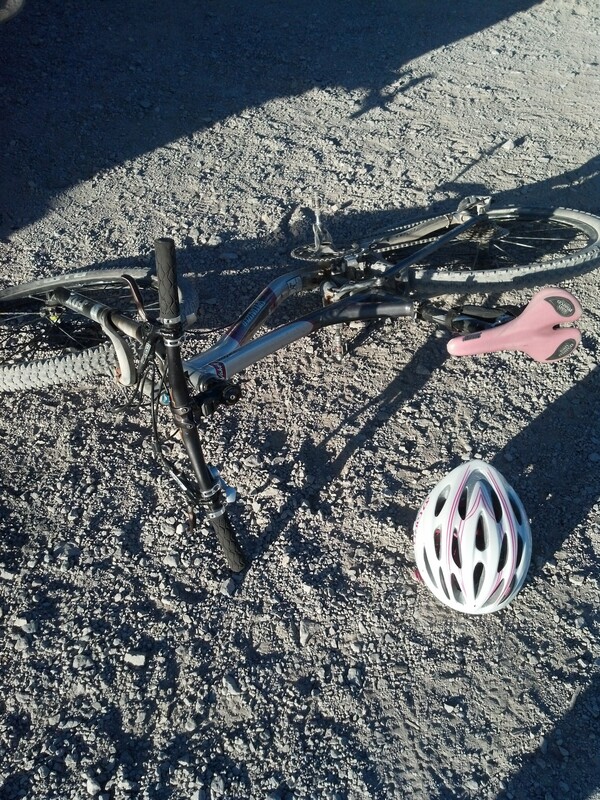 I always forget how terrible I am at downhill biking. You never really think about that, but when there are major hills I clam up and think about the fact that I am going really fast and could be part of the asphalt if I don’t play it right. 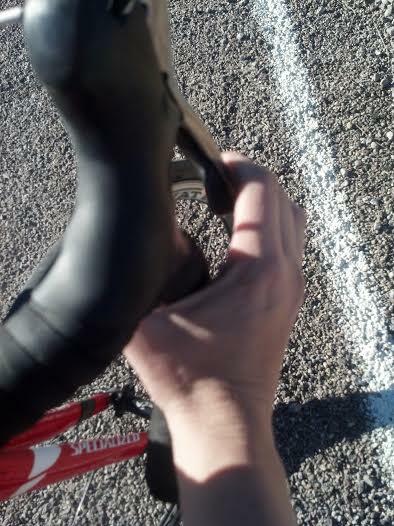 I had to keep stopping because I was developing the “crab claw”, which is from holding your brakes so tight that you can’t let go. I hate to say it but I’ve had the “crab claw” before during races too. I don’t think you can tell in this picture, but this downhill is intense once you make it to the highest point of the loop. The whole loop from where we parked on the other side of the mountain is about 15 miles. The inner loop, which is very steep, is about 4 miles. If you look closely in this picture, on the left hand side towards the top, you can see your destination. Just take my word for it, it is a big climb. 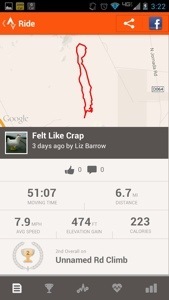 My Strava totalled about 2600 feet in climbing. This guy came along with me and decided to show me up and do three loops around the hard part of the course. 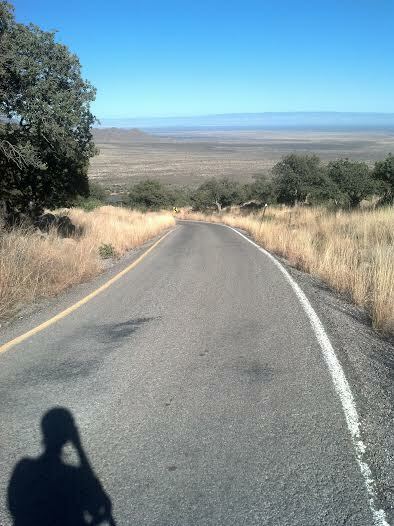 On the climb back to where I was picked up, I felt pretty great because the climbing is very gradual. I even made a Queen of the Mountain on the final ascent! I totally recommend this ride for strengthening hill climbing skills. 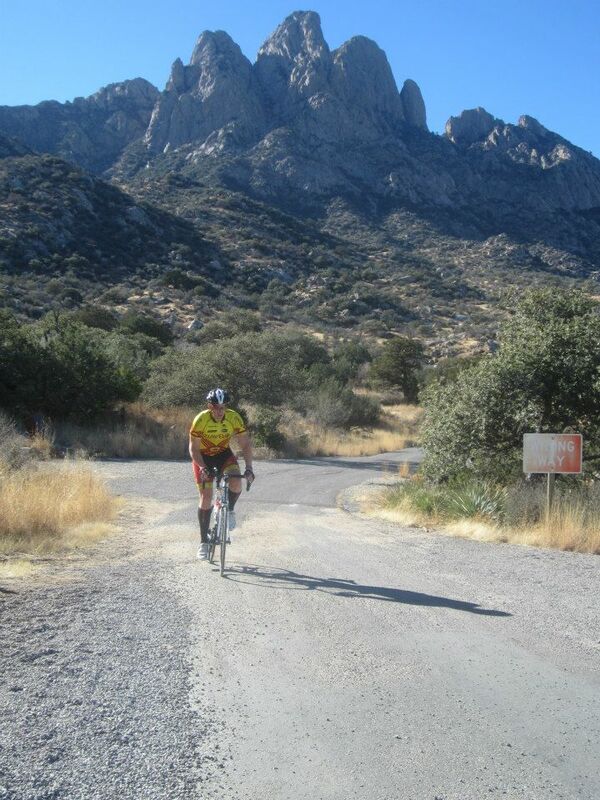 I did this ride right before my first road race in 2011 and it definitely prepared me for it. 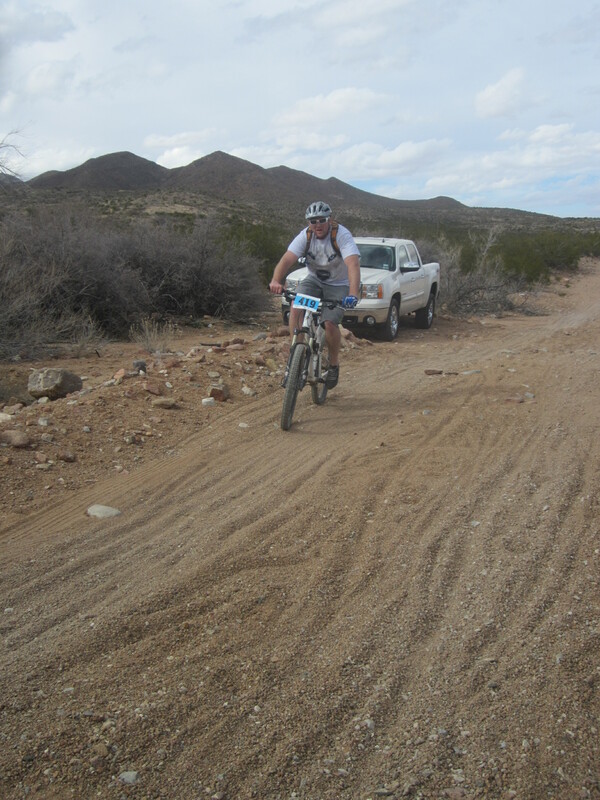 The New Mexico Off Road Series is looming in the future (March 2014) and I am currently trying to get back on the mountain bike to race. The last time I raced big time was in 2011. I’ve been riding since four weeks postpartum, but I will be honest and say that it took about six months to feel normal and even now, I still don’t feel completely 100 percent. 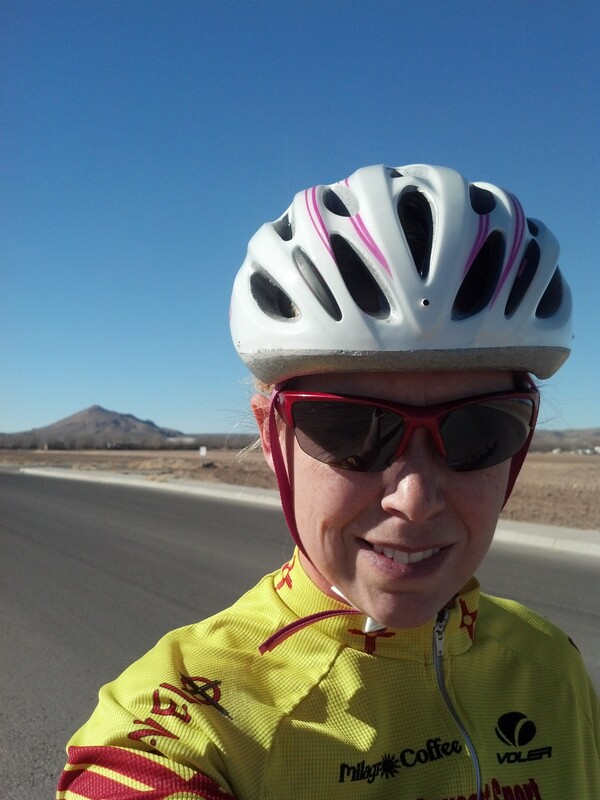 I think my saving grace right now is the road bike, believe it or not. There was a time that my husband would have laughed out loud at the thought, but I am a true believer (and he is too) that if you want to be a great mountain biker than you get in some miles on a road bike too. I have seen it happen to my husband and I can see it happening to me now. It’s funny how 15 miles on a road bike is so little, but on a mountain bike that is a Cat 2 mountain bike race! 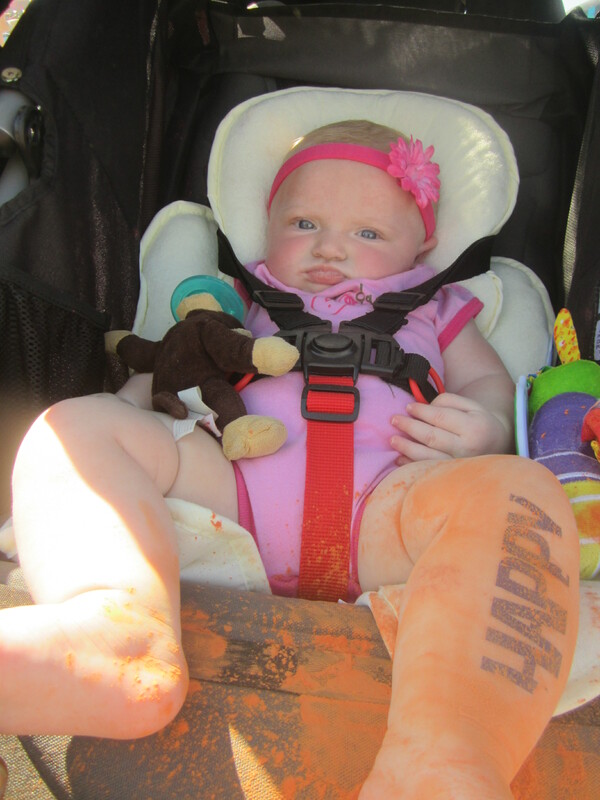 I can’t go riding without my lucky charm. 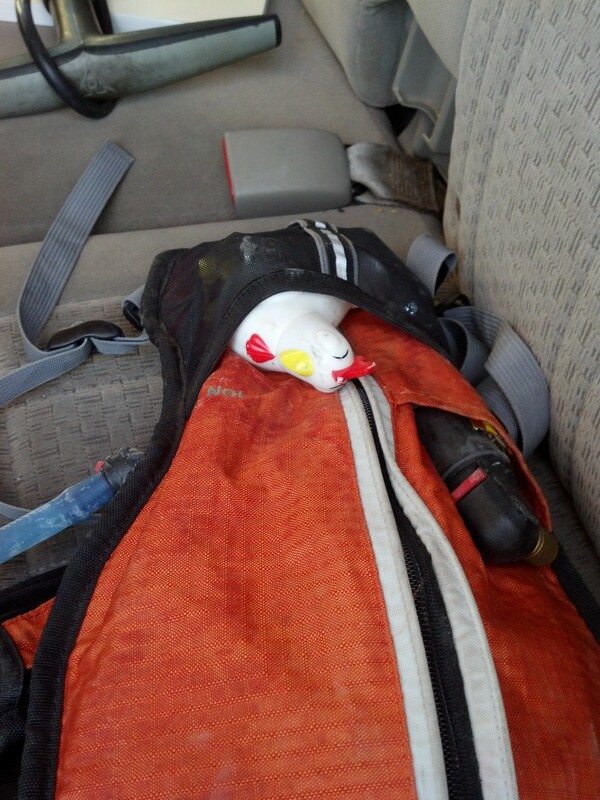 I’ve had this Hen in my Camelbak since my first race in August 2009. It could have been the cookies, the egg nog, cinnamon rolls, and other sinful treats that pretty much ruined any momentum we had to our diet. Both Mike and I have weighed in this week and have gotten to the “angry phase” of dieting where you are so mad at yourself for getting to where you are. We are loving the Sonic ice! 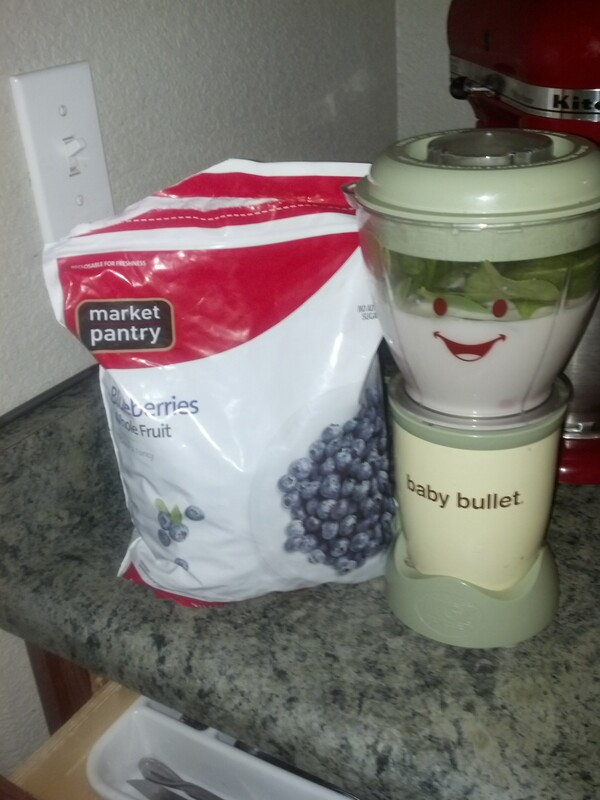 It blends so much better and works well with small blenders (like the Baby Bullet…don’t hate). 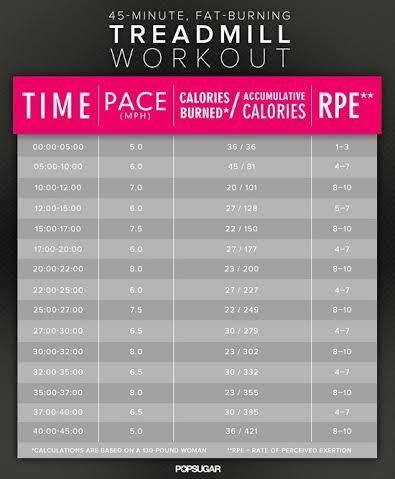 I tried this treadmill workout today from www.fitsugar.com. Loving the treadmill workouts lately! So when a week gets too busy that you start to jumble everything into one blog post, you just have to call it a “Week In Review”. I really want to try and document as much as I can while I am staying home since this will not be a permanent thing for me, but I have found I have been MORE busy than when I had a job! First off, how cute is that when I toss a binkie at my daughter and she immediately puts it in her mouth? 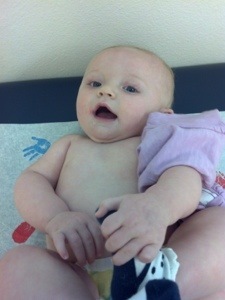 Olivia had her six month check up too this week. I was glad to get some answers to questions I had. She didn’t grow too much height-wise this past couple of months, but she made up for it in weight. 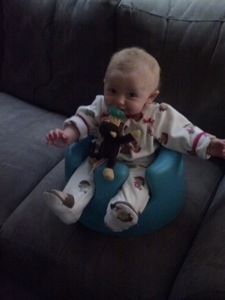 And let’s just say her head is in the 90 percentile, so I have no worries about her head growth. She still is a long thing at almost 26 inches (25.8 to be exact). She was a champ! I felt like I was in the kitchen the whole week. I was making soup for an Enrichment activity and then I made Mike some corned beef and cabbage, which is an awesome fall/winter food. 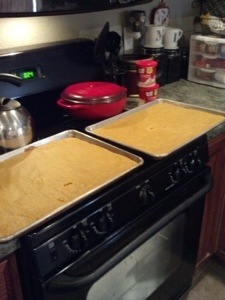 (Too bad our house stunk. People kept walking in and asking if Olivia had pooped. Ha!) We had a youth activity this week where we made hygiene kits for charity. 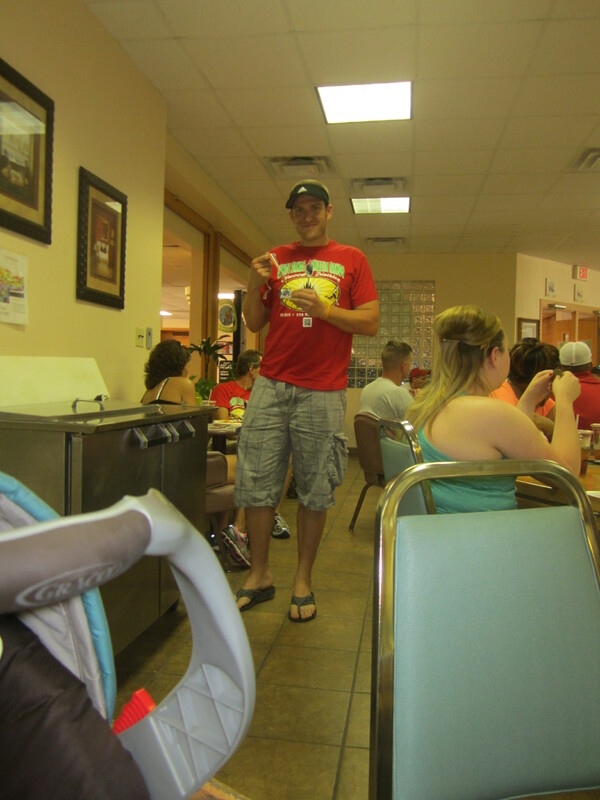 It reminded me of when we went to the Ronald McDonald house back in April and they had the kits available for us. It makes me feel good that we can give back. I’m always so appreciative of what they did for us. Transitioning to crib. That’s all I have to say. And let’s just say that it was been a LONG week when it comes to sleep. 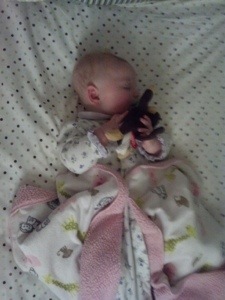 This girl sure did like her Rock and Play and this mom misses her not sleeping through the night. She is getting better though. She only woke up twice last night! 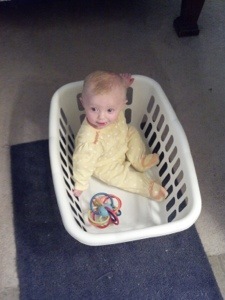 When in doubt on where to put a baby, laundry baskets work well. We started off the week with colds. 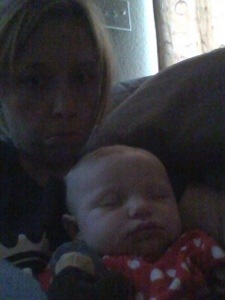 It made for a very fussy mom and child (poor Mike!). Thankfully, we are both out of the clear now, but it sure is nice to get some cuddling in! Remind me that I will not have these times back! 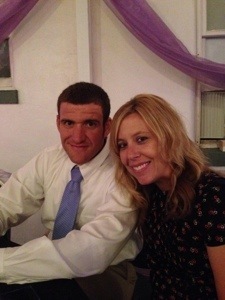 We ended the week by going out on a quick date to a coworker’s wedding. I don’t even remember the last time Mike and I went out and dressed up. It was fun to hang out and have some time together and talk. He sure was a trooper! And I got to see my lovely friend Stephanie and as we were leaving, I saw my fellow seventh grade science teacher Britt. I sure do miss them! (But not the job…hehe). Hope you all had a great week and Happy Friday! 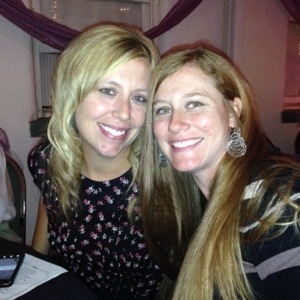 Question: Do you think wearing black at weddings is bad luck? I was feeling a little guilty tonight about wearing black (mind you that my wedding was black and white) and I swear I have heard that people frown on it. Is that true? 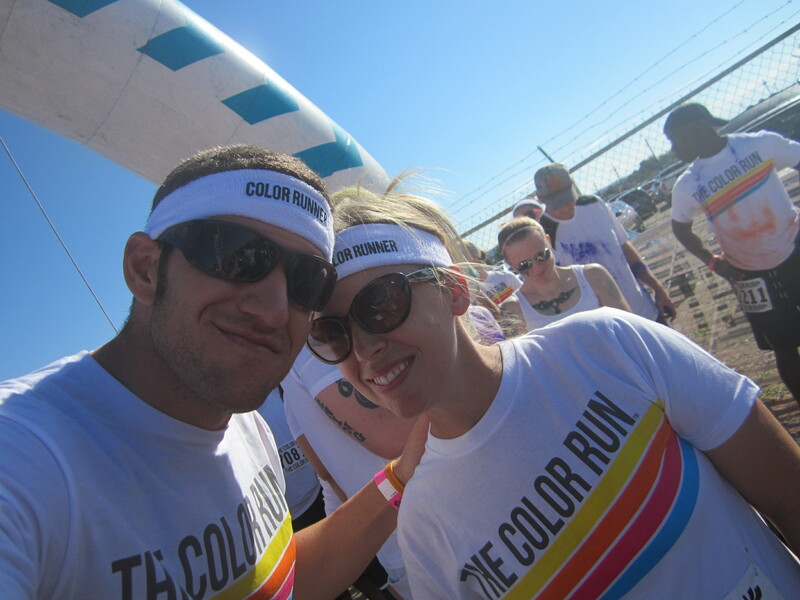 Last year Mike and I did the Color Run in Albuquerque with his brothers (which ended up being a fiasco of losing our car keys and spending two days trying to get them remade…meanwhile, finding out I was pregnant). This year, we found out it was going to be a little closer to home, so we had to go try it out with my good friend Stephanie and her husband Bill. 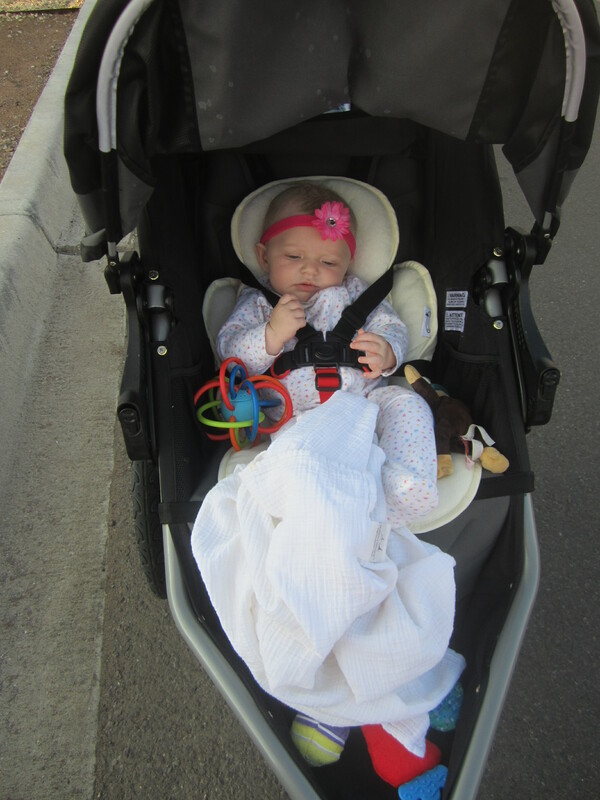 We had to have Olivia try out the shenanigans too, so we brought the jogging stroller and put a weather shield over it to protect her. We had to stand at the start for a while because of the congestion. It was a pretty big crowd. Meanwhile, people were already busting out with the paints in the air! Olivia was already getting bombarded! 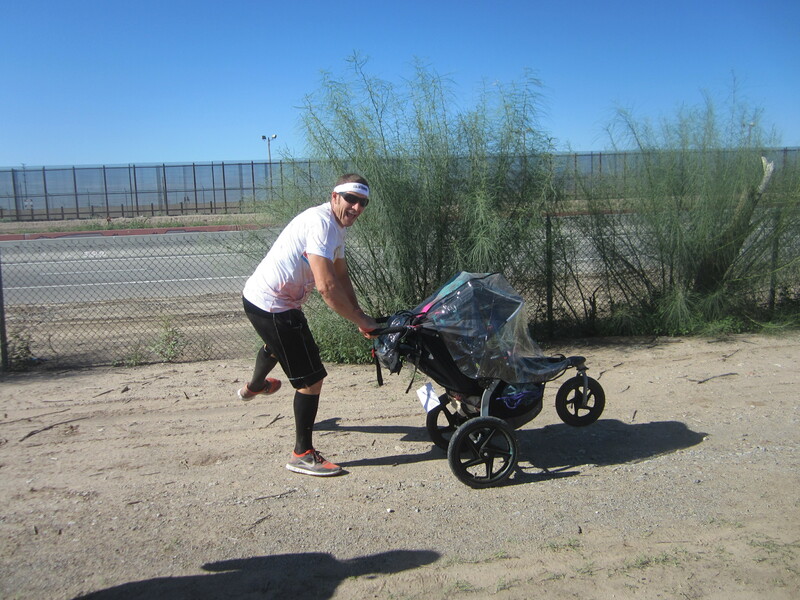 Mike took the stroller for the first half of the race. He looks so cheesy in this picture! 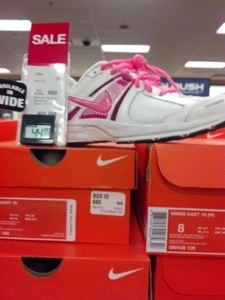 I love this shot of all the “haze” left over from the pink portion. Mike being Mike….again. Poor Olivia. 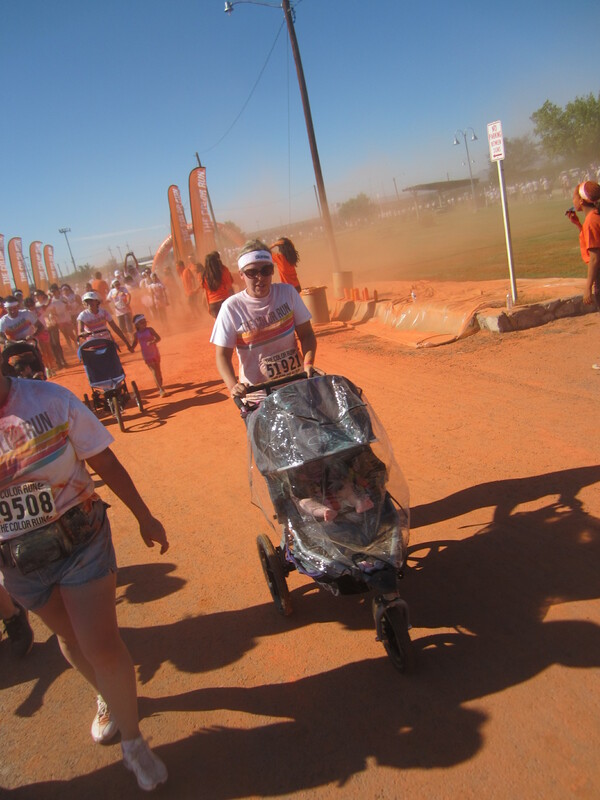 FYI…she slept the whole race! 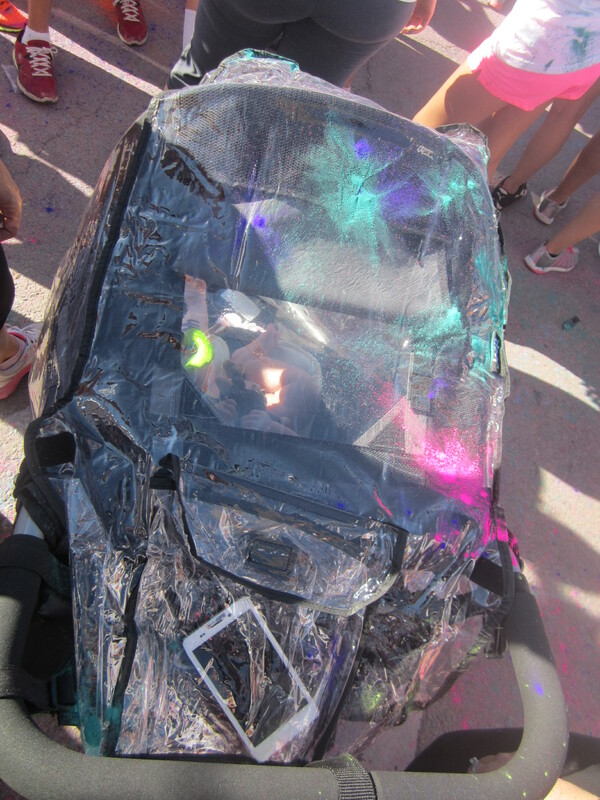 I took over mid-way and was trying to find a way to avoid the colors with the stroller. That was not happening! I was kind of bummed because the end was so congested, you really couldn’t run it! It was more like a walk from the 1.5 mile mark. I wish they had more street space on this one. Overall, it was fun. I would say that if they changed the venue that I would do it again in El Paso. 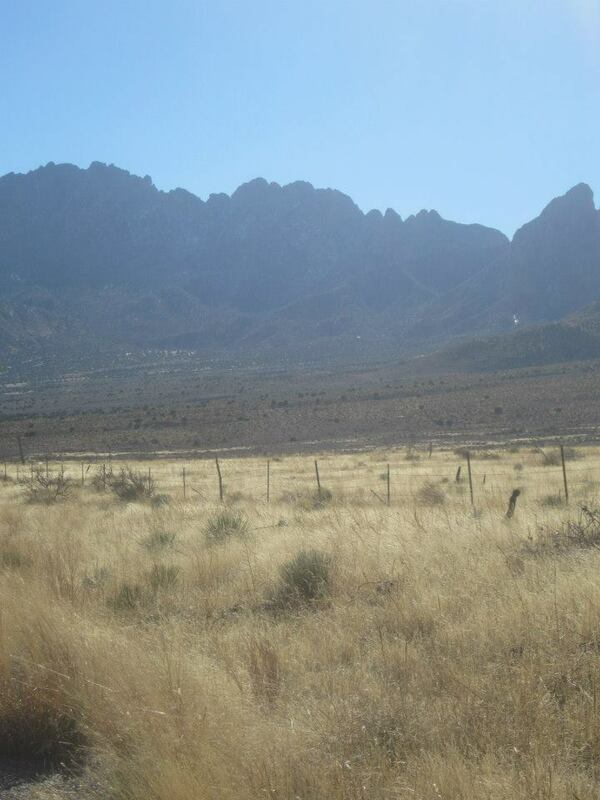 Otherwise, I am willing to go back up to Albuquerque next year. What a fun way to get people out running. Thanks to the Kellys for joining us! 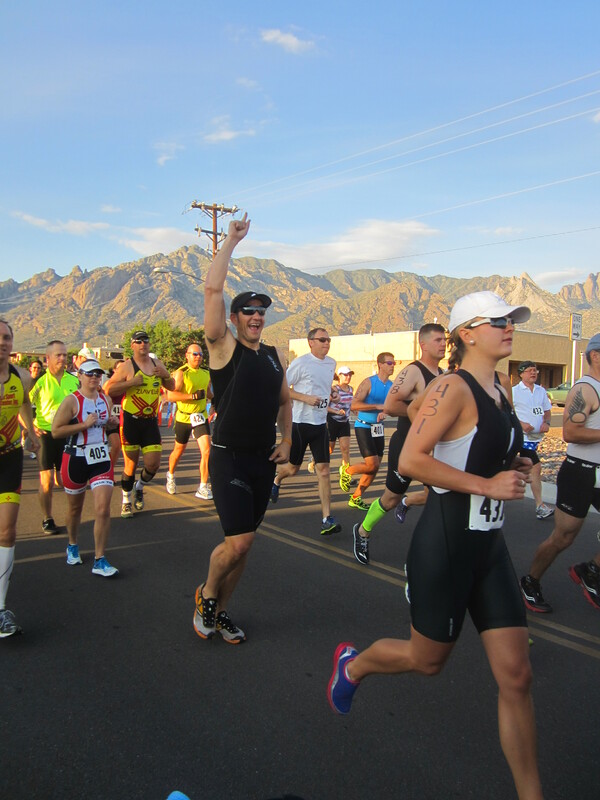 We are now starting to repeat triathlon races! 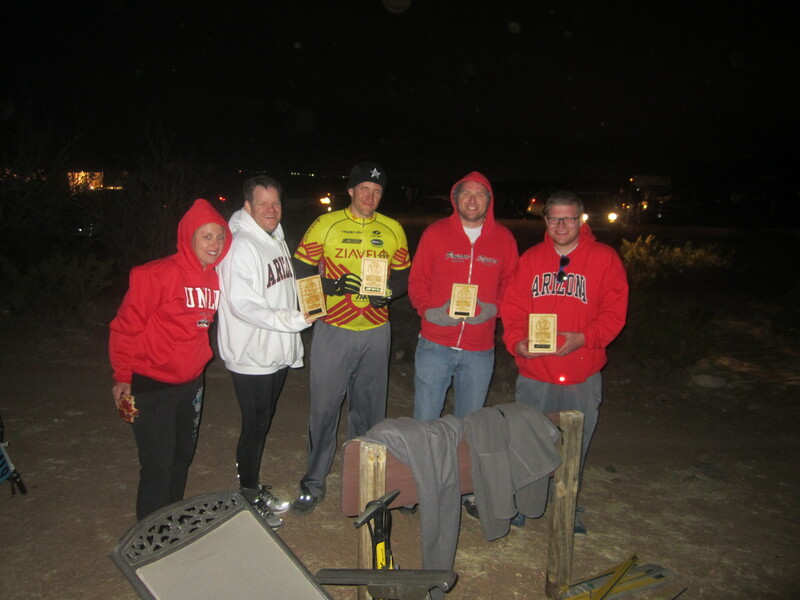 It was time for the Yucca Triathlon at White Sands Missile Range this past month. 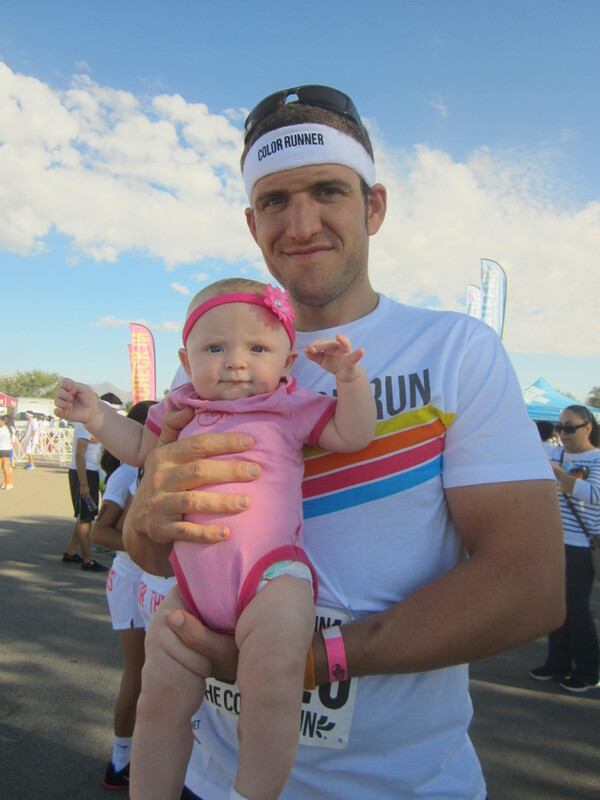 Considering this was Olivia’s first triathlon last year (I was five weeks pregnant when I did it), we had to go do it again! 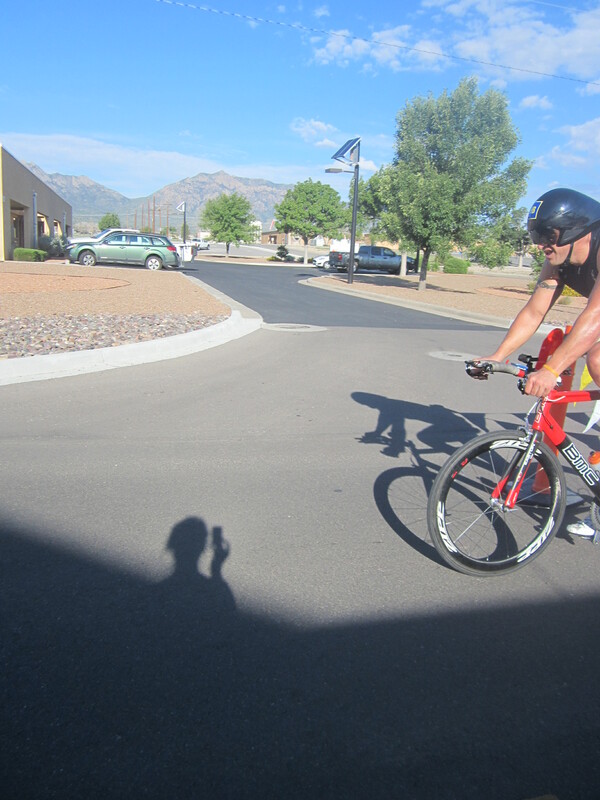 This was also the triathlon that got Mike interested in competing in triathlons too! 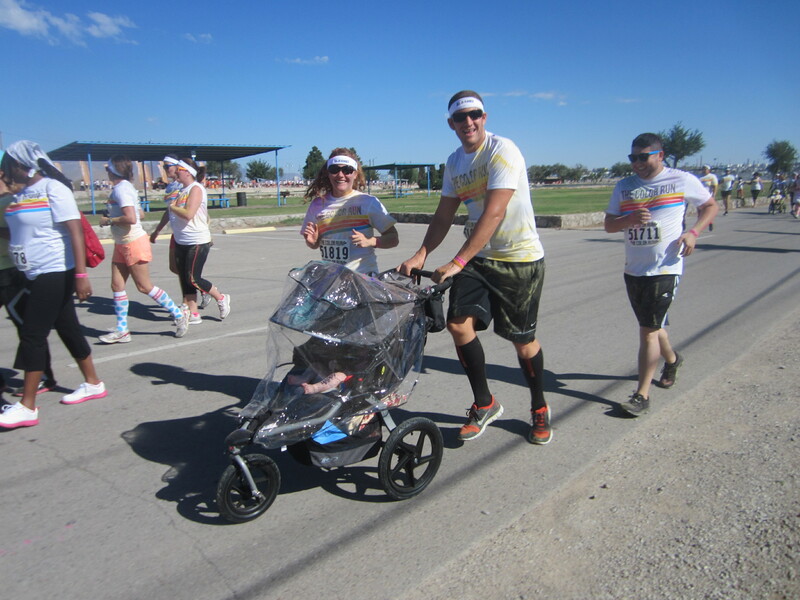 I was bummed to not do it this year, but it was fun to watch and take pictures with the jogging stroller! Mike came in third overall and first in his category. The weird thing that happened that day was that there was a gas leak in the pool area. While Mike was out on the bike, I could hear a bunch of fire trucks coming (which could send anyone into heart attack mode) and then they made us stay away from the building. 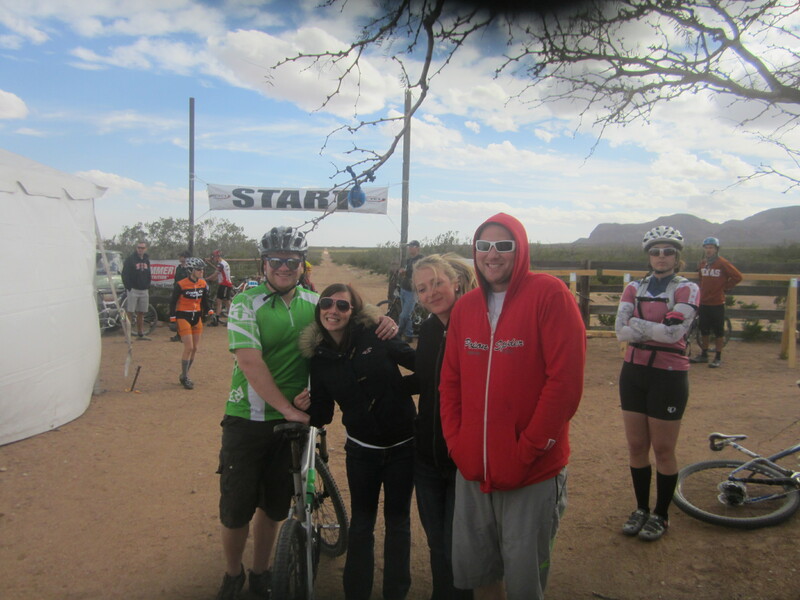 So it ended up being a duathlon! No swim! Olivia was a trooper. 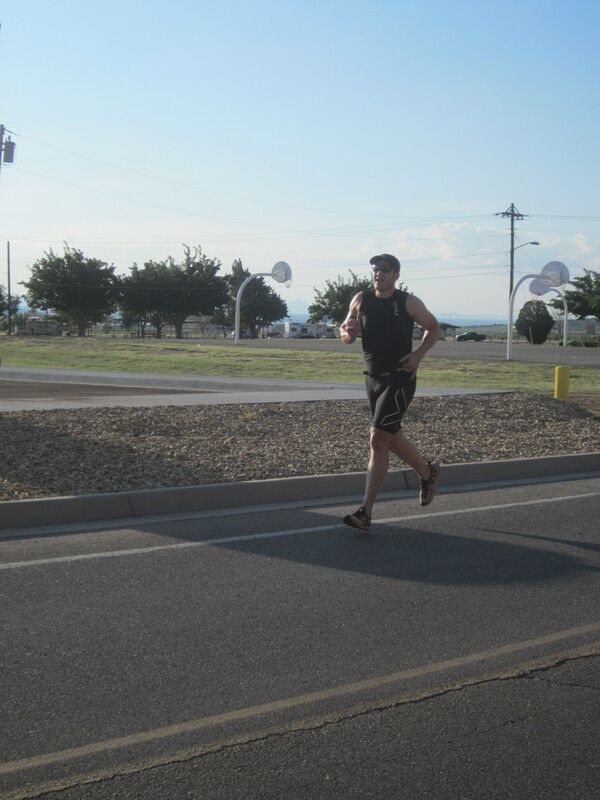 I wanted to run part of the running coarse, so I did it backwards and met them at the halfway mark and took pictures. I ended up getting some personal records on my Strava so I was pretty happy about my stroller jog. 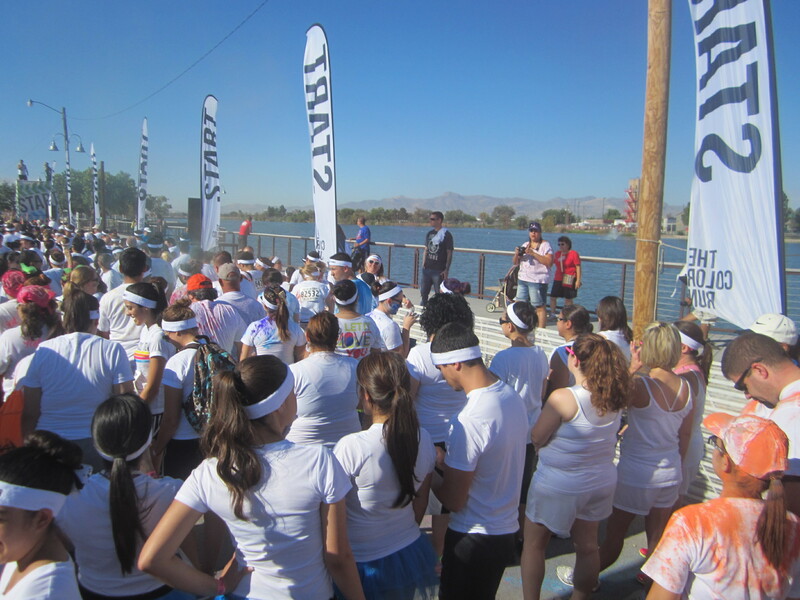 Here is Mike at the starting line…being Mike. 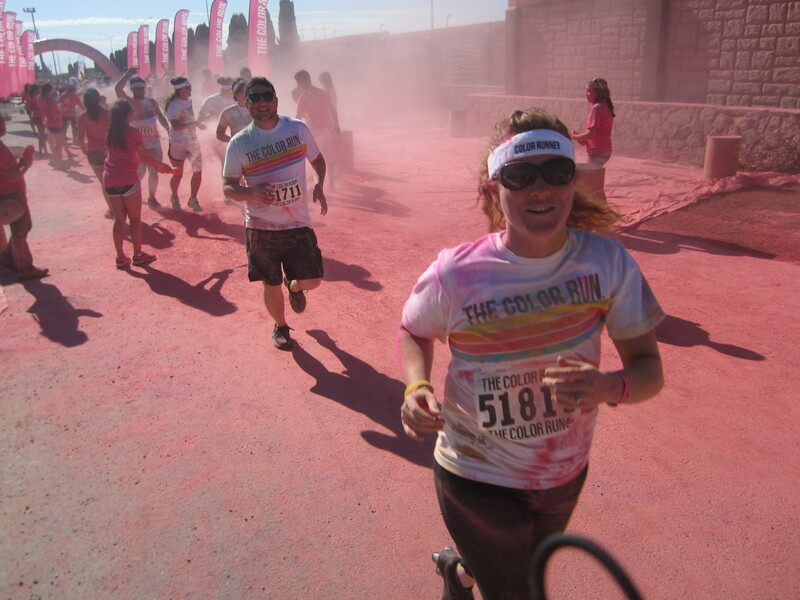 I loved the pictures of all of the people running because the back of the Organs are in the background. Of course, the only close up picture of Mike didn’t have the awesome mountains. It was fun to hang out as a family on a race day. Beautiful weather too! Overall, it was a success.